Recently, the roles of fathers and husbands in families have been recognized as important issues. They appear in legislation aimed at deadbeat dads, social movements including the Million Man March and Promise Keepers, in the development of advocacy groups, and in think tanks. Therefore, contemporary research on men in family relationships has very mixed results. Some studies show that fathers have small effects on child development and in preventing antisocial behavior, whereas others suggest no effects. Other research claims that the primary importance of men in families is in their role as providers. Although some studies state that the husbands' and fathers' most vital work occurs in new families, others indicate that it is when their offspring reach adolescence. Confusing the issue even further, labor market trends predict that men's family roles may diminish. Based on the presentations and discussions from a recent national symposium on men in families held at The Pennsylvania State University, this book addresses these issues. 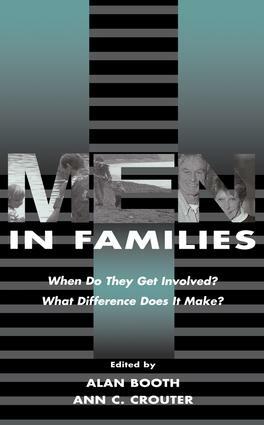 This is the only book that deals with men's involvement in families in a comprehensive way. Although several books focus on fathers alone or on a broader family perspective, this is the first book that deals with a variety of family roles on an interdisciplinary basis. Although most of the writers are psychologists or sociologists, there are key figures in history and anthropology who also make important contributions. As such, this volume will be useful to scholars, students, policy specialists, and family program administrators. "The contributors bring a wide range of multidisciplinary perspectives and theoretical frameworks to their explorations of husbands and fathers that, taken together, help to clarify the mixed findings of the current literature on men in family relationships." "…this volume makes some important contributions to the literature on men in families. For serious scholars interested in man's issues, this book is a worthwhile addition to their library." Contents: Preface. Part I: Men's Roles in Families: A Look Back, A Look Forward. S. Mintz, From Patriarchy to Androgyny and Other Myths: Placing Men's Family Roles in Historical Perspective. L.M. Burton, A.R. Synder, The Invisible Man Revisited: Comments on the Life Course, History, and Men's Roles in American Families. A.J. Cherlin, On the Flexibility of Fatherhood. M.E. Lamb, Fatherhood Then and Now. Part II: Men's Investment in Parenthood. H.S. Kaplan, J.B. Lancaster, K.G. Anderson, Human Parental Investment and Fertility: The Life Histories of Men in Albuquerque. P. Draper, Who Should Fathers Father? W. Marsiglio, In Search of a Theory: Men's Fertility and Parental Investment in Modern Economics. C.A. Surra, Subjectivity and Practicality in Mating and Parenting Decisions. Part III: Marital Relations: What Do Men Contribute? J.M. Gottman, Toward a Process Model of Men in Marriages and Families. S. Coltrane, Gender, Power, and Emotional Expression: Social and Historical Contexts for a Process Model of Men in Marriages and Families. J. McQuillan, M.M. Ferree, The Importance of Variation Among Men and the Benefits of Feminism for Families. S.L. Nock, Marriages in Men's Lives. Part IV: Fathers: When Do They Make a Difference? P.R. Amato, More Than Money? Men's Contributions to Their Children's Lives. J. Belsky, Paternal Influence and Children's Well-Being: Limits of, and New Directions for, Understanding. F.F. Furstenberg, Jr., Social Capital and the Role of Fathers in the Family. J.A. Seltzer, Men's Contributions to Children and Social Policy. S.L. Brown, M.F. Bumpus, Men in Families: Looking Back, Looking Forward.